Jeeze - I must have jinzed you when I asked Scott on Sunday if everyone was healthy now! How many stitches did Scott get this time? How many is that in total? 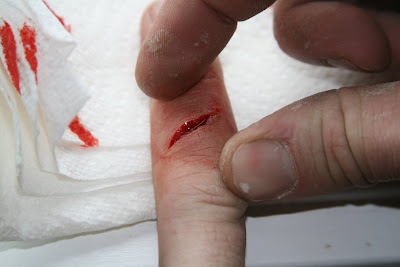 I just found the pictures of when he smashed his finger with the weights at ET High. Yikes! That looks painful. I'm glad you survived this latest round of stitches!! One, that picture is NASTY!! Two, poor Zoie, sounds like it could have been a lot worst though. I do hope you guys have good insurance! !